Dogs have pretty amazing noses. 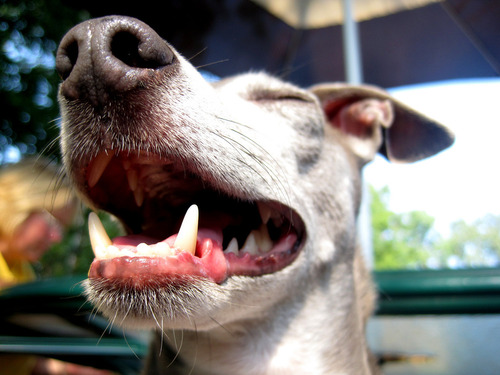 According to NOVA's article on Dogs' Dazzling Sense of Smell, they can detect some odors in parts per trillion. In other words, a dog could detect a teaspoon of sugar in two Olympic-sized swimming pools. They can also wiggle their nostrils independently, which allows them to determine which nostril received an odor. Unfortunately, engaging their sense of smell is one of the least common ways we tend to interact with our canine buddies. Olfactory enrichment, or stimulation for a dog's sense of smell, is a great boredom-buster for dogs. The average dog spends a lot of time with nothing to do. People work long days and have many competing commitments and interests. All of this down time for our dogs can result in stress, boredom, and destructive behaviour. One way to engage that amazing sense of smell for mental stimulation is to play fun nose games with your dog. Here's an easy one to teach your dog at home, "Go Find". 3 matching containers with lids. Cut slits in one lid to release the scent of treats. One dog who knows how to sit and stay. Step 1: Place some smelly treats in the container with the lid that has slits. At first, you will use only one container. Have your dog sit and stay. Allow your dog to smell the container with the treats inside. Place the container on the floor a few feet away from your dog, within eyesight. Return to her and reward her for staying with a small treat. Release your dog from the stay and tell her to "Go Find!" When she arrives at the container, open it and allow her to eat the treats. Do this about five times, then take a break. Playing for brief periods will keep the game fun! Step 2: Follow Step 1, but begin to hide the container out of sight, such as in the next room. Continue rewarding your dog for staying in place, then release her to "Go Find!" Allow her to use her nose to find the container with treats. Make the hiding place more obvious at first, to help your dog be successful. Keep it fun and animated! After Ruby eats the treats from the container, we like to run back to the spot where she'll "stay" for the next round. Step 3: This time, use 3 containers with lids, only one containing treats. Avoid getting the smell of treats on the two empty containers. Ask your dog to sit and stay, then allow her to smell the container with treats. Place all three containers on the floor a few feet away from her, within sight. Return to her, reward her with a treat for staying, then release her and tell her to "Go Find!" Reward her enthusiastically for finding the container with treats by opening it and allowing her to eat them. Step 4: Follow Step 3, but hide the three containers out of sight while your dog stays in place. Place treats only in the container with slits.